I live in Brazil and think that is a very good analysis of what happens here. Specially where it is said that the problem is in the culture of the people. It is hard to fight corruption in the politics when it is spread in the people’s culture. I was in Peru last week. We mostly toured Cuzco and the Sacred Valley of the Incas. If you believe that Tocqueville was right, and that liberalism is inculcated by institutions throughout society that teach men to be responsible citizens, then there is little hope that there will be liberal democracies in places like that very soon. Before 1532, Peru, with Ecuador, Bolivia, northern Chile, and some of northwestern Argentina was the Inca Empire. The Inca Empire did not have canons, horses, or steel weapons, and they could not defeat the Conquistadors. Nor did the Inca have writing, laws, or money. The Conquistadors arrived, defeated the Incas, and looted everything they could lay their hands on. They then imposed serfdom upon the natives. Peruvians have little reason to believe that government can be about anything other than predation, nor do they have much reason to believe that law, and a free market economy can be the basis of a prosperous and free society. I know that Peru is a different place than Brazil, but the history of Brazil may not be essentially very different. Socialism functions in society in the same manner as lampreys upon salmon. Eventually, the host to which it affixes itself weakens, then dies. WTF? Leaving aside the insanity of baking a “right” to a particular retirement age into your Constitution, why make the female retirement age lower? Women typically live longer than men — thus they should have more working years! While your analysis about too much government is obviously true you miss the real reason Brazil is doomed and will never recover – demographics. The white percent of the population is shrinking rapidly while the African/African-mixed population is booming. Whites are now less than 50% of the population and by the end of the century will be under 20%. Whites are far more productive, economically speaking, than blacks and are smart enough to change their mind on policy. Blacks are unproductive and don’t have the IQ level to understand complex systems and will only vote for corrupt politicians who promise them things. Brazil will never recover. Its only hope is that technology advances in other countries and the spill over improves the lives of Brazilians despite their demographic situation. The question is whether the US will come its senses and stop our suicidal immigration policies that are leading us to become the next Brazil. 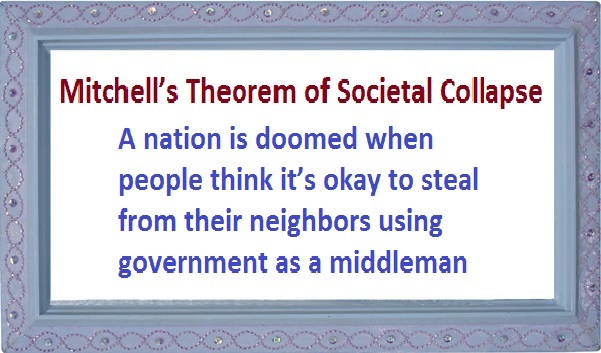 The Mitchell’s Theorem of Societal Collapse needs a slight refinement. Socialism is the fraudulent idea that we will individually and collectively be better off spiritually and economically when we live at the expense of each other. To that end, we must allow others to take our income and wealth from us, just as we take it from them. The fundamental structure of this violates the Ten Commandments that forbid lies, coveting and theft. From a secular standpoint, none other than Vaclav Havel showed in his essay The Power of the Powerless  that socialism induces a moral corruption in every interaction people have, when truth itself must be suppressed to sustain the political ideals that elites are attempting to force society to adopt in their lives. This stirring essay tells us what living hell life in a socialist Utopia really is. The economist Ludwig von Mises showed in 1920 [2,3] that since a socialist economy destroys price information via government intrusion, the myriad of participants in the economy are unable to make a fully rational calculation about true profit and loss. Any economic activity that operates at a loss cannot be “sustainable”, a concept the left loves to scold us about, yet cannot really grasp. Some American (and Canadian) elites seek to make their countries more like Europe, but the costs of socialism make it morally, socially and economically unsustainable. We see this in the socialist vanguard of Greece and how utterly impoverished socialism is making their economy. We are headed in that direction. “The Use of Knowledge in Society,” American Economic Review, XXXV, No. 4; September, 1945, pp. 519–30. What we are seeing in the USA is people from countries like Brazil immigrating here not because they want less government but because our government is perceived to be a fatter goose to pluck.